Gifted center with high hockey IQ and elite puck-moving ability, Hischier will make an immediate impact for a Devils team that desperately needs an offensive revival. The Devils moved up from #5 to #1 in the lottery to land Hischier, look for him to make the jump to the NHL next season. Coming from a family of former NHLers, Patrick is a strong two-way center with the tools to be a future #1 in the NHL. He was the consensus #1 pick coming into the year but two major injuries the past two season ultimately hurt his stock in the end, the Flyers move from #13 to #2 in the lottery and are thrilled to add Patrick for the future. The Stars love defense from Finland in recent years (Julius Honka, Esa Lindell), and they land one of the top blueliners in the draft in Heiskanen, who played top-pair minutes as a 17-year old in the Finnish Elite League this past season. Look for him to make the jump to the NHL in the near future. Touted as the best offensive defenseman in the draft, the Avs seemed like a perfect fit for Makar as they desperately need help on defense. Worst team in the NHL fell from #1 to #4 in the lottery, while they missed out on a Hischier/Patrick they draft the position that was needed most. He’s committed to U-Mass Amherst for next season. A gifted center out of the Swedish Elite League (2nd tier), the Canucks add some desperately needed depth at center in the young Swedish forward. However this pick drew some raised eyebrows with several higher-rated centers available, it remains to be seen if the Canucks made a mistake passing on guys like Gabe Vilardi, Cody Glass and Casey Middelstadt. The first pick in Golden Knights history is a versatile two-way center in Cody Glass, one of the top players in the WHL this past season. 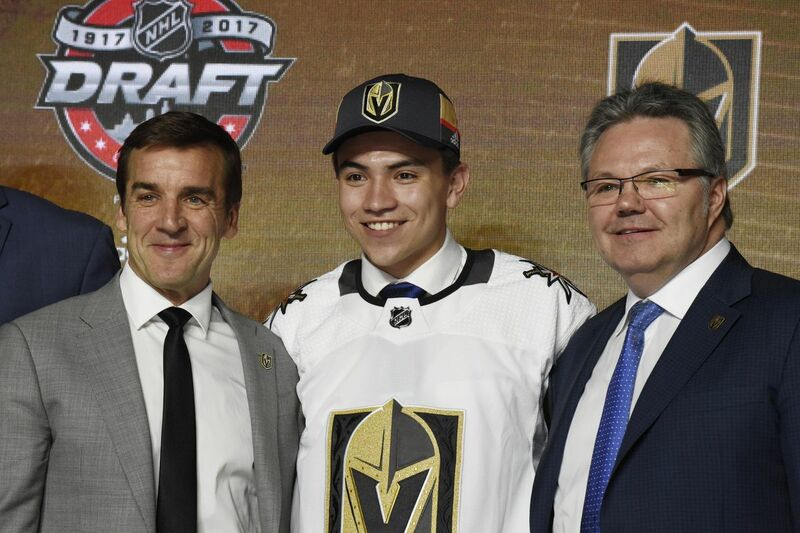 With Vegas likely not being competitive next year he will benefit from another season in the WHL, but look for him to be an impact player in the near future for the Golden Knights. The Rangers traded Derek Stepan/Antti Raanta to the Coyotes a day before the draft to receive the #7 pick, and many people thought they would take a defenseman to replace some needs. They choose to go off the board with Andersson, an offensive center who needs some work (committed to Frolunda in the Swedish Elite League next season). This to me is the worst pick of the first round, one that might piss off some Ranger fans in a few years to see what they missed out on (Middelstadt, Tippett and Vilardi). Two-time All-USA High school player of the year, Middelstadt is an extremely gifted young center with potential to be an offensive star in the NHL. He’s committed to the University of Minnesota next season and will benefit from tougher competition, but with Eichel O’Reilly and Middelstadt the Sabres are poised to be one of the strongest teams down the middle in a few years. When you are talking about prospects who are physically “NHL ready” a guy like Rasmussen definitely comes to mind, already 6’5 221 pounds at 18 years old. The Red Wings are in the midst of a rebuild and need help all around, adding a strong power-forward in Rasmussen is a good step in the right direction. The Panthers win big selecting Tippett at #10, touted as perhaps the best goal scorer of the draft class he’s got a dynamic shot that can beat goalies from all over the ice. A smooth-skating winger who can play both LW and RW, Tippett joins a slew of talented young players in Florida. In Dale Tallon’s first draft back in charge as GM, the Panthers add one of the best players in the draft. Every year a player seems to fall in the draft for no particularly reason, and Vilardi is the guy this year. Many people had him as a top 5 pick (#4 on my list), yet several teams with center needs passed on Vilardi and might seriously regret it down the road. A two-way center who works tirelessly, Vilardi was a huge part of the Windsor Spitfires Memorial Cup win last month. Despite falling in the draft the Kings seem like a perfect fit for Vilardi, a guy who will be part of the core in LA for years to come. Son of former Avs defenseman Adam Foote, Callan is a big body (6’4 215 pounds) with a lot more offensive upside than his dad. He won’t be the physical defensive nightmare that his Dad was during his playing days, but Callan is a guy that can play in all situations and will be a future top-pair defenseman. With the trade for Mikhail Sergachev and the drafting of Foote, the Lightning have two young pieces that will man the blueline for years to come. Lou Lamiorello with the steal of the draft taking Timothy Liljegren at 17th overall, the smooth skating Swedish defenseman was #2 on the draft boards coming into this season and fell after battling a case of mononucleosis during the year. He will return to Rogle BK in Sweden next season and will benefit from another year of development with older players in the SHL. Liljegren has future top-pair defenseman written all over him and Mike Babcock must be thrilled to add another talented Swedish defenseman. At 5’7 153 pounds, Yamamoto is the shortest player taken in the first round in NHL history. However, don’t let the size fool you, Yamamoto is a dynamic offensive player very similar to Lightning center Tyler Johnson. He gives the Oilers another offensive weapon at Center behind McDavid, which will allow Drasaitl to remain on the wing in the future. Yamamoto is one of the most offensively-gifted players in the draft and a few years from now teams are going to wish they didn’t pass on him. The only goalie taken in the 1st round, Oettinger was one of the best goalies in the NCAA this past season with Boston University. The young American goaltender will likely return to BU next season but figures to be the future #1 goalie in Dallas. For a team that has had big trouble in net the past few years, adding Ben Bishop and drafting Oettinger is a huge step in the right direction. The Predators add another European offensive weapon in Tolvanen, one of the top players in the USHL last season with over a point per game. After making the Stanley Cup finals David Poile finds great value in a late 1st round pick, and Tolvanen could be another strong offensive asset in the near future for the Predators.